Hip and hot trends and styles are changing every day. However, as some great men once said ‘Old is Gold’. That is true even in the case of WordPress themes and webdesign. Old and aged looking designs are coming back and capturing the eyes of the viewers, which is also the reason why lots of people started using vintage and retro WordPress themes for their websites. Thus, a large number of designers and developers are taking up to designing vintage and retro WordPress themes to provide website owners with beautiful templates which they can use for their purposes. And indeed, these vintage and retro inspired WordPress themes can provide an exclusive look and feel to websites of any kind. Vintage and retro templates are further aesthetically distinct and come with a timeless appearance combined with modern functionality. Retro and vintage WordPress themes will hardly ever be considered outdated, as they are perfectly suitable for all kinds of segments, like business websites, personal blogs, portfolio or photography. Therefore, these WordPress themes are ideal for bloggers, webshop owners, designers and other creatives. We have collected some of the most popular and best vintage & retro WordPress themes. 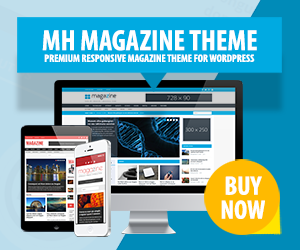 The flexible MH Magazine WordPress theme can be used to launch beautiful vintage websites. This popular magazine WordPress theme is perfectly suitable to create unique retro online magazines, news websites or personal and professional blogs about retro living, vintage lifestyle, fashion and trends or else. MH Magazine comes with beautiful custom widgets to display your content in an appealing way. You may further use suitable widget titles and fonts to give your WordPress website a nice retro and vintage look and feel. Ronneby is a quite popular WordPress theme which is perfectly suitable to create unique vintage and retro style websites. As Ronneby is translation ready, you can translate your website into your local language and thus reach out to your audience. This flexible WordPress theme can be used to create all kinds of different websites as it offers powerful options, useful features and a couple of included premium plugins. With Borderland you can create vintage retro inspired online shops, blogs or portfolio websites. This vintage and retro WordPress theme gives you all flexibility to create versatile websites which suit your taste and requirements. Benefit from such great features like different header styles, nice parallax backgrounds or transition animations to set up dynamic online presences with ease. Vigor comes with a pure and clean, yet retro inspired design and a well-structured layout. This retro and vintage WordPress theme can be used to create all kinds of website concepts - blog, portfolio, shop, one-page and many others. Vigor further comes with a dynamic parallax slider to present your articles and images in a great way and may catch the attention of your website visitors in a second. Retro is a very popular vintage portfolio theme. This one-page WordPress theme comes with a responsive design, retina integration for banner and logo, new icons, portfolio gallery, numerous color options, anti-spam filter, detailed documentation and so much more. You can quickly create the layout based on your requirements and make your site super easy to navigate. You will also be able to expand your reach with the translation module and contact form. Are you searching for a content friendly theme with vintage and retro touch? Nexus could fit perfectly, as this magazine WordPress theme comes with a strict grid, typographical hierarchy and a clean layout which puts your content into spotlight. This retro inspired WordPress theme is very strong and can manage loads of content. The included features are top-notch and give your website content a well-structured appearance on all modern devices, whether mobiles, tablets or desktops. Cabin is a vintage WordPress theme that is suitable not only for blogs and personal websites, but also for fancy online shops with a retro appeal. Cabin is highly customizable in several ways and you'll surely find those features and options which you might need for tweaking your website according to your liking. Using the included Visual Composer plugin, you can easily create pages and arrange their layout by drag & drop. Wild Book is a highly-customizable, multi-purpose retro theme for use with WordPress. Using this flexible WordPress theme, you may leave a lasting impression on your visitors. Wild Book comes with a unique, oversized sidebar design that is completely customizable to suit your needs. You can also modify a variety of theme elements using the familiar theme customizer interface. Simply change backgrounds on a per-post basis, personalize the color scheme, and customize the header with no coding experience necessary. The Wild Book WordPress theme is a comprehensive retro template that further looks great on mobile devices. This responsive retro WordPress theme is ideal for non-profit and charity organizations or corporate businesses. Its features are professional and if you want, you can also modify Bhinneka to suit your personal style. You may use the sliders, Google Fonts, unlimited colors and background variations to create an attractive website. The fluid proportion-based grids, sub-page navigation, scroll to top link and others help to make your online presence fluid and functional. Northern Gentleman is a comprehensive portfolio WordPress theme with a memorable vintage style. It comes with a high-end collection of premium features so you're able to create aesthetically appealing retro websites using a drag & drop interface and an extensive theme options panel. You may further customize fonts, colors and a variety of theme elements in real-time using the built-in theme customizer, so you can preview your changes before saving them. The Northern Gentleman WordPress theme is suitable for all modern desktop browsers and mobile devices. This retro and vintage WordPress theme provides a consistent and welcoming environment for your visitors. The OM WordPress theme is a gorgeous retro template that can take your current website to the next level. This retro WordPress theme offers many selectable pre-defined homepage layouts in a retro-style. OM is a flexible solution to present your content in a professional and attractive way. You may customize the fonts and colors using a simple interface to personalize the theme to suit your taste. Om WordPress theme is fine tuned for use on all modern mobile devices and desktop browsers. This retro WordPress theme is a great solution that can leave a lasting impression on your visitors. INKA is a new-age theme with latest features and retro-flavored design. It can serve many purposes with ease and efficiency. INKA retro WordPress theme is best for creatives, designers or else. This modern WordPress template comes with many helpful plugins like the Revolution Slider, Accordion Slider and FlexSlider. INKA is also WooCommerce ready and mobile friendly. You can keep all those features that you like and quickly alter things according to your style. The PN WordPress theme is a unique template that can give your website a great retro look and feel. It is a retro-styled creative WordPress theme that is suitable for a variety of uses such as creative agencies or a personal portfolio. You may make use of the included premium features that allow you to create engaging pages with a beautiful retro design. PN was developed and designed with today's modern desktop browsers and mobile devices in mind. It is a beautiful retro and vintage WordPress theme that can provide you with a stylish online presence. In case you want to add a retro flavor to your restaurant, bar or café website, then Cafeteria WordPress theme is a great choice to stick with. This responsive retro WordPress theme gives your website a fresh and neat look and makes it load very well on all kinds of modern devices with different screen sizes and resolutions. Cafeteria is loaded with a bunch of other great features, helpful shortcodes and offers 600+ fonts, SEO optimization, WPML compatibility and much more. Golden is a responsive retro WordPress theme which is mobile friendly and thus looks good on different kinds of screen size resolutions. It is perfect for freelancers and agencies, yet also suitable for many other segments. You can take advantage of helpful theme options, utilize Google Fonts, shortcodes, working PHP contact form and many other tools. Golden retro WordPress theme is highly customizable and user-friendly. Hipster is a charming and user-friendly retro WordPress theme with a fancy retro appeal. If offers awesome styling tools like 30 background patterns or 2-page layout styles (stretched or boxed). Hipster is perfect for personal and business websites and loaded with all kinds of up-to-date features that give you great functionality. By displaying your Twitter Feed, Instagram Feed, Contact Form and Responsive FancyBox, you can reach out to your audience. Vintage Wedding is a fully responsive and SEO optimized wedding WordPress theme with a vintage look and feel. You can use Vintage Wedding to create beautiful and simple wedding websites to share all necessary information about your greatest day. By using the powerful features and options you may present your content in a unique and indiviual manner to give it a personal touch. The Consilium multi-purpose WordPress theme is an awesome retro template for your website. You may make use of simplistic yet powerful features to create an amazing online presence with a retro twist that is functional and visually appealing. To help you along the way, a handful of high-end premium plugins come bundled with this retro WordPress theme that not only saves you money, but also looks amazing. The Consilium retro WordPress theme was fine tuned for all kinds of mobile devices and ensures your visitors receive a consistent user experience for every visit. Rated by Forbes as one of the 10 best premium themes in 2013, this premium vintage theme has been designed with great attention to details and offers plenty of features and customization alternatives. Retro offers unlimited colors, five pre-designed skins, Revolution Slider plugin and Google Fonts to style your site accordingly. This retro inspired WordPress theme can be installed with only a single click and provides good functionality to let you start right away. Extinct is primarily a beautiful portfolio WordPress theme, but can also be used for blogs and other websites that like the vintage look and feel. This vintage WordPress template is packed with fancy touch/swipe sliders, powerful admin options, multi-language support, Revolution Slider, Flex & Nivo Slider, 500+ retina icons and lots more. Tuned Balloon is perfectly suitable for singers, bands, music, event websites and all those web platforms that revolve around music. This premium music WordPress theme is very easy to use and offers different post formats to create a smooth and well-formed website. By supporting the WordPress theme customizer you can make changes and view them in real time before saving them. PersonalPress is a simple, yet brilliant blogging theme with an appealing vintage and retro look. It is content friendly and easy to use. PersonalPress is further light-weight and fun to work with. This retro WordPress theme is loaded with a bunch of modern features that follow the latest WordPress practices to always keep your site up-to-date. Are you looking to set up an online shop with a vintage touch? Benissimo WooCommerce WordPress theme is a powerful template with many useful features. You can highlight your products in the most efficient manner and your customers can get complete information via the Cloud Zoom like image effect, Grid/List product view and others. Benissimo retro WordPress theme could be a fast and smooth solution for your website.